When you’re not getting a good night’s rest your bed could be the culprit, especially if it’s more than seven years old and showing signs of sagging or wear and tear. Replacing your bed provides an opportunity to get that perfect marriage of style and comfort in the bedroom, so that you can be totally devoted to bedtime once more. It’s really down to personal preference whether you pick a divan or bedstead, since either can be fitted with the mattress of your choice. A bedstead makes a dramatic design statement – just imagine a bed upholstered in luxurious jewel-toned velvet or subtle grey linen, giving that boutique-hotel feel in your own bedroom. Or how about elevating your home with the high lines of an elegant four-poster? A divan might be the plainer choice, but these beds can pack a load of bedroom storage within the base and simply adding a statement headboard opens up the design possibilities. If you’re on a budget, upgrading a basic divan this way can give a room a whole new look. In an ideal world, allowing at least 45cm of free space either side of the bed leaves enough room to vacuum and change the sheets. Divan beds come in the same sizes as standard mattresses or can be made to order in bespoke sizes. If ordering one with drawers, don’t forget to allow space for them to open. Bedsteads take up more room than divans, especially the plump, upholstered type and wooden sleigh beds. Both divans and bedsteads usually come in sections to make it easier to get them around corners or up the stairs. For two adults sharing, a king size or a super king bed will always provide a comfier night’s sleep than a standard double bed. Both partners should be able to lie on the bed with hands behind their heads and elbows out, without touching, and the bed should be 10-15cm longer than the tallest person sleeping in it. What do I need to know about bedsteads? Plump upholstered beds are so invitingly cosy. Select a tall headboard for dramatic impact, a buttoned version to rock the retro-vibe or curvy wings to add to the feeling of being tucked in. There are almost as many fabric and colour choices as for a sofa; when making your choice be practical as the upholstery can’t be removed for cleaning. As part of a traditional bedroom design, pick a brass bed or a polished wood sleigh bed. 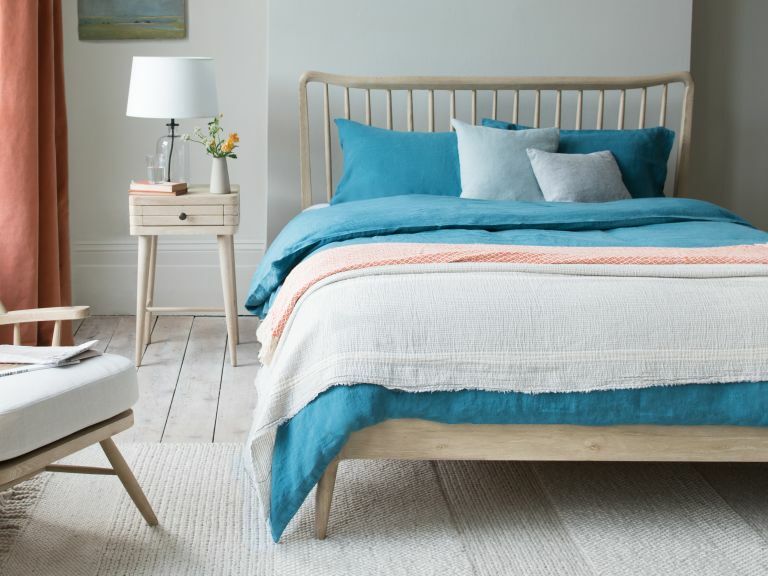 If it’s a contemporary bedroom scheme you’re after, a wooden bed with slim legs and an elegantly airy, strutted headboard has the clean lines you need. Most bedsteads have a slatted base. Rigid slats will give a bed a firmer feel; check that gaps between slats are less than 9 to 10cm, or the mattress will wear out more quickly. Flexible slats sit in a frame and are bowed for springiness. A divan bed comes as a set of mattress and an upholstered box base. The simplest base has a solid platform on top, creating a firm support for the mattress. More luxurious sprung divans have a spring unit on a wooden or metal frame, so that both the base and mattress can adjust as you move in bed. Firm edge divans have larger, heavy duty springs set within a wooden frame. A divan base can be set on legs or have castors. How can I include storage? The big plus of a divan bed is the storage drawers which can be incorporated either side or at the end. Half-size ‘continental’ drawers are useful if a full size drawer would be obstructed by a bedside cabinet. A maxi drawer is handy if storage can only be accessed from one side. Wooden storage beds and some upholstered versions are designed for maximum capacity, with drawers at the sides and end. In a small bedroom where space for opening drawers is limited, choose an ottoman bed, where both base and mattress lift to reveal masses of storage within; a hydraulic system lightens the load. It makes sense to buy the best mattress you can afford. A luxurious pocket sprung mattress will be be supportive and flexible. The mid-price option is continuous springing, a woven mesh of coils. Open spring mattresses, with individual hourglass springs, are the budget option. If springs aren’t your thing, go for a visco-elastic or memory foam mattress, which responds to your body weight then returns to shape once you get up, or a latex mattress, made from a durable and resilient anti-microbial natural material. Many mattresses are hybrids; sprung mattresses can have a memory foam top, while cushion top or pillow top mattresses add an extra layer for a softer and more luxurious bed. Some mattresses are champion heavyweights. If you won’t be able to lift the mattress easily, and not all come with helpful handles, consider a no-turn mattress. Should I pick an adjustable bed? If your idea of bed includes watching Netflix or catching up on work emails, or if you have a medical condition, an adjustable bed could be the answer. In double versions, each side can be adjusted individually, with multiple options for raising your head, legs and body. Buy the mattress at the same time since these are specially made. Check that electrical parts come with a guarantee and are compatible with UK systems. How do I know the bed will be comfy? Don’t be shy in store. Stretch out fully on the bed for up to 10 minutes, changing position just as you do when sleeping. Slip your hand underneath the small of your back. If you can move it easily, the mattress is too hard, and if you can’t, it’s too soft. Roll over on the bed; if too soft, it will take a lot of effort, if too hard, you’ll feel pressure on your hips and shoulders. If it’s a bed for you and a partner, lie on it together. With a pocket spring mattress you’re less likely to roll together, but if there’s a big difference in your weights, consider a zip and link bed with two mattresses. Which bed is right for my children? Once babies graduate from a cot, a toddler bed with a cot-size mattress and side rails is the next step. Or consider an extendable bed that starts short, at around 140cm, then pulls out to a full-size bed as they grow. 'While single and bunk beds are well known styles, there are actually ample different children's beds to choose from. Of course looks are going to be an important factor in order for you to achieve a stylish kid's bedroom, but floor space, storage and sleepover solutions should all be considered too in order to get the most from your room,' advises Séverine Thirion, managing director of children's furniture store Aspace. There’s never enough space for toys, so to pack in toy storage with a cabin bed or mid sleeper with drawers and shelves, or roll-out storage units beneath the mattress. 'A classic single is a smart choice for a child's first "big" bed: there's room to sit together at story time, they're safe to climb in and out of and underbed storage or a trundle bed can easily be added at a later date. A cabin bed is also a great way to keep clutter at bay with ample room for toys, books and clothes. A high sleeper has enough space beneath for a desk, a daybed, shelving or even a wardrobe. Once children are six or older, bunk beds are fun. The bunks must be securely joined: check that internal wooden dowelling with cross fitting screws or metal dowels with intersecting bolts are used, and that the ladder is secure. Will your new bed be made to order? Ask about guarantees, delivery charges, and dates. Try out beds in store but by all means shop around online for the best deal – which will also give you the opportunity to read reviews from other customers. For upholstered beds, request a fabric sample so you can see the colour and quality at home. If you need a mattress in a hurry, order one in a box – it’ll be less bulky to get up the stairs and should come with a money-back guarantee if you just can’t get comfy. Read more at Sleep Council.